Last Friday, my friend and I sat down with a bottle of wine and two laptops. 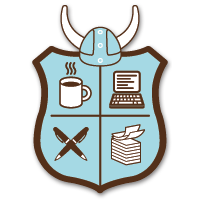 For the second November in a row, we set out to conquer NaNoWriMo. I had been looking forward to this for months, planning to write the sequel to the young adult novel I wrote during this past May’s spring NaNoWriMo. I had wine, good company, and an outline–all set. And yet when I attempted to write the opening pages of my manuscript, I felt paralyzed with anxiety. The starting is always the hardest part. My thirteen-year-old niece is participating in the teen version of NaNoWriMo this month (smaller word count, but still impressive) with her language arts class. When I spoke to her on the phone, I felt responsible as a veteran of NaNoWriMo to bestow some sage advice on the young rookie. When I sat down to write the next night, I realized I needed to listen to my own advice. Don’t be afraid to skip around. I was finally able to get going only after I realized I didn’t need to mull over the opening pages all night. Sure, I think it’s important to try to write the book in order because too many fragments may be hard to piece together at the end, but with a handy dandy outline to guide you, you won’t get lost if you jump around in the story. When you’re trying to reach your day’s word count (or really thinking beyond NaNoWriMo and how to be a successful writer who writes everyday), you have to figure out what works for you. Often, writing what you want in that moment (in some cases professional writers bounce between genres in order to keep their creativity flowing) is the best way to prevent writer’s block. For the sake of your sanity, find a writing buddy. Think of it this way: you’ll have someone to share the cost of wine. You’ll also have someone to bounce ideas off of. You’ll also have someone to answer questions that pop into your mind without having to scour the internet and end up falling down the Wikipedia rabbit hole, wasting a half hour of valuable writing time (believe me, I’ve done it countless times). Mostly, remember that NaNoWriMo is just a fun way to get you thinking about your writing in a more dedicated way. It’s an opportunity to provide you with structure and to teach you to meet deadlines. Even if you don’t make the 50,000 word count, you still have the start of a story, some new tricks to stay focused on your writing, and a lot of empty wine bottles.